Rainy and cool here today. Part of my dreary mood is because the Cubs lost last night. Sure hope they win tonight! Made beef stroganoff in the crock pot last night. It was good, but I like it made the traditional way better. Bought another package of pecan sandie cookies to replace the ones Addy ate. Going to hide these from her! haha. 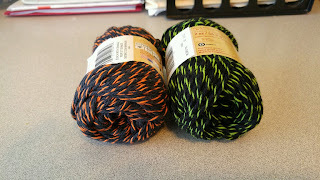 Picked up a couple skeins of cotton yarn at Wal Mart today. I want to say they are Halloween colors. What do you think? I just might have to make a couple Halloween dish cloths!